It took me a while to find time for this post. I could tell you a touchy story on how busy I was being a parent and having a full-time job at the same time. However, so many people have all this and still manage to do much more than just writing a single-page blog post. So I better shut up and proceed with the topic. In the previous post, we’ve discussed a way to find a commit which caused tests to fail. Though it was relatively easy and didn’t involve many things to do, there still were actions we had to repeat again and again. Namely, we ran tests and invoked git bisect depending on their status: bad for red, good for green. It looks like we can simplify our flow if we figure out how to automatically pass test results to Git. Fortunately, as usual in Unix world, there’s already a command to do exactly this. Let me quote the official documentation. > git bisect run sh -c "java -cp out/test/git-bisect-example-project:out/production/git-bisect-example-project:/Users/artspb/.m2/repository/junit/junit/4.12/junit-4.12.jar:/Users/artspb/.m2/repository/org/hamcrest/hamcrest-core/1.3/hamcrest-core-1.3.jar org.junit.runner.JUnitCore me.artspb.example.project.MainTest"
artspb@artspbs-MBP ~/I/h/git-bisect-example-project> git bisect run sh -c "java -cp out/test/git-bisect-example-project:out/production/git-bisect-example-project:/Users/artspb/.m2/repository/junit/junit/4.12/junit-4.12.jar:/Users/artspb/.m2/repository/org/hamcrest/hamcrest-core/1.3/hamcrest-core-1.3.jar org.junit.runner.JUnitCore me.artspb.example.project.MainTest"
There are two commands invoked. The first one is git bisect start. It’s needed to initiate the process, we’ve covered it in the previous post. The second one is git bisect run with a long-long string as a shell script. Indeed, a combination of old Java 8 and JUnit 4 forces us to manually pass the whole classpath which consists of test and production folders as well as JUnit jars. Later we can hide these details in an sh-file, but now we should answer a question: why it didn’t actually work? Git claims [good] working on code to be guilty, but we already know that [bad] broken test is to blame. Additionally, we can see that tests had 3 failures and zero successful runs which differs from our previous experience. It’s suspicious. 🤔 Frankly speaking, it took me some time to figure out what’s wrong. It turned out that the reason is simple: we forgot to recompile the code after checkout. Previously, IDEA did it for us just before the test run. Now we have to take care of this ourselves. OK, fine, let’s make the line even longer by including javac. artspb@artspbs-MBP ~/I/h/git-bisect-example-project> git bisect run sh -c "javac -d out/production/git-bisect-example-project/ src/me/artspb/example/project/Main.java && javac -d out/test/git-bisect-example-project/ -cp out/production/git-bisect-example-project:/Users/artspb/.m2/repository/junit/junit/4.12/junit-4.12.jar:/Users/artspb/.m2/repository/org/hamcrest/hamcrest-core/1.3/hamcrest-core-1.3.jar test/me/artspb/example/project/MainTest.java && java -cp out/test/git-bisect-example-project:out/production/git-bisect-example-project:/Users/artspb/.m2/repository/junit/junit/4.12/junit-4.12.jar:/Users/artspb/.m2/repository/org/hamcrest/hamcrest-core/1.3/hamcrest-core-1.3.jar org.junit.runner.JUnitCore me.artspb.example.project.MainTest"
Finally, it works as expected. Of course, the first thought that crossed my mind was who would ever do it this way? No one builds Java programs manually nowadays. So I decided to prepare another project with the same sequence of commits but this time using Gradle. You can find it here. 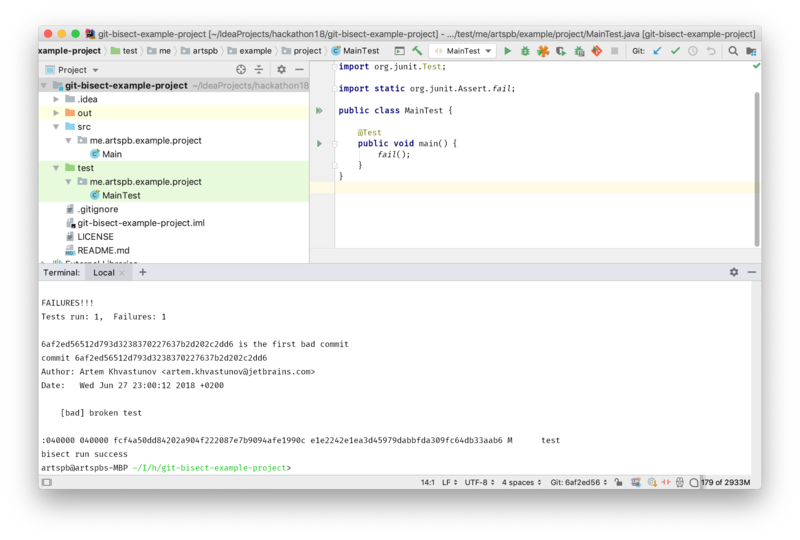 git bisect run ./gradlew test looks much nicer, and we don’t need to worry about compilation any more thanks to Gradle. It’s always great to have a tool which does all the routine for you. So, what is the takeaway of this article? You can automate git bisect with a shell script which does commit verification. In the most common case, it runs unit tests. Depending on your build system, it can even be a simple command. The next obvious step would be IDE support, but this is the topic for the next post. Stay tuned and thank you for reading.